Brainerd, Minn. ­ The accolades continue to grow for the Brainerd Golf Trail, the Midwest’s No. 1 golf destination. Golf Digest, in its May 2005 issue, ranked four courses on the Brainerd Golf Trail — The Classic at Madden’s, Deacon’s Lodge, the Legacy Courses at Cragun’s (Bobby’s) and Golden Eagle Golf Club – among its 20 Best Courses in Minnesota (public and private). Nationally, The Classic is ranked 50th and Deacon’s Lodge is ranked 88th in Golf Digest’s 100 Greatest Public Golf Courses latest biennial listing. Golf Digest’s 800-plus panelists on its national course-rating team used eight criteria in ranking the top courses: shot values, resistance to scoring, design variety, memorability, aesthetics, conditioning, ambience and walkability. In Golf Digest’s list of the 20 best courses in Minnesota, there were eight public courses. 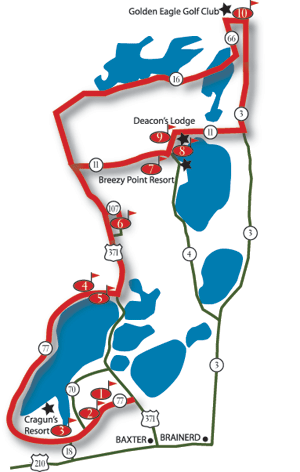 Four of those courses are on the Brainerd Golf Trail. The Classic is No. 2 (8th overall), Deacon’s Lodge is No. 3 ( 9th overall), Dutch’s Legacy is No. 7 (19th overall) and Golden Eagle is No. 8 (20th overall). The latter two made Golf Digest’s Best in State ratings for the first time. Interestingly, two of the courses were designed by big-name, nationally known architects and two were designed by local talents. The Classic was designed by its long-time superintendent, Scott Hoffman; Arnold Palmer was the architect for Deacon’s Lodge; the Legacy was designed by Robert Trent Jones Jr.; and Golden Eagle was designed by former PGA Tour pro Mike Morley of North Dakota and former NHL defenseman (and ex-golf pro) Bruce McIntosh, a native Minnesotan. For information on the Brainerd Golf Trail, call (800) 450-2838, extension 426. Brainerd is just over a two-hour drive from the Twin Cities, and the Brainerd airport is served by daily flights on Northwest Airlines.